With consumer VR system finally here, 360° videos have made a serious come back. Both YouTube and Facebook What Are Facebook's 360-Degree Videos and How Do You Upload Your Own? What Are Facebook's 360-Degree Videos and How Do You Upload Your Own? Mark Zuckerberg recently unveiled something new coming to your News Feed. It's called 360 Videos, and Zuckerberg thinks it's the future of watching videos. Read More support the format for playing on any device with mouse navigation, or with rotational tracking from within a VR headset HTC Vive Review: Virtual Reality is Finally a Thing HTC Vive Review: Virtual Reality is Finally a Thing The HTC Vive for Steam VR redefines gaming, and more besides. It's the closest thing to a Holodeck I've ever seen. And it's absolutely incredible. Read More . The oddly-named Elephone Elecam 360 makes it cheaper than ever to get started producing 360° movies — available for around $140 from GearBest.com. Dual 220° wide-angle fish-eye lenses. Records at 960p total resolution, at 30 fps. Includes a 32 GB microSD card, helmet mount and bicycle clip. Mobile companion app for iOS and Android available. The device is small and light, similar to a GoPro. It features a standard mini-tripod adaptor on the base, so it can connected to any number of generic accessories — and even includes an odd choice of bike and helmet mount in the package (more on those later). Video stitching is not performed on the camera, so the raw video appears as two fish-eye views side-by-side. This means you need some kind of software stitching to combine these two halves into the rectilinear format needed for video uploads. Elecam has produced its own stitching software, though there are also third party solutions you can use. The Mac version of the converter software is a little crippled, as it won’t deal with images, only video. To process 360° images, you’ll need to use the Windows version of the software. This is fairly typical with Chinese products, as Macs are far less popular there. The fact they even have a Mac app at all is quite unique. The same is true with Android vs iOS app support. They have an iOS app, but I gave up after every photo caused the app to crash. The Android app is updated more often, with more features. The app allows you to preview the video with a variety of viewing modes, though I couldn’t find any way of exporting the formatted video from within the app, so presumably this is just a preview feature. Once videos are processed and stitched together, you’ll need to use the official YouTube Metadata Injector app to enable them in 360° format. Even then, it’ll take YouTube an hour or more to process your video on their end (after the usual upload and processing), with no feedback on progress, so you might think it’s actually broken. It does work — just give it some time. I should be clear that this is not unusual with any of these 360° cameras: formats are still non-standard, and nothing is automatically detected by YouTube unless it has correct metadata. 3D videos are no different, either, so this awkward processing is not unique to the Elecam 360. 360° photos can be uploaded to Facebook after processing, but again, you’ll need to edit the metadata — this time, changing the model and make of camera to something on the list of compatible devices, such as “RICOH” and “RICOH THETA S” respectively. Hopefully Elephone will update their firmware or software at some point to correct this, but for now the process is quite laborious. In fact, you may not realise this, but you can already create great quality 360° Build Your Own Google Street View Using An Android Phone Or DSLR Camera Build Your Own Google Street View Using An Android Phone Or DSLR Camera If you have an Android phone or DSLR camera, you can now create your own Street View, which is laid on top of a Google Map. You can even embed the image on your website. Read More using your mobile device and the Google Street View app — so I see little reason to use the photograph function of the Elecam 360 at all. Your mobile device has a better camera, and as long as your scene remains relatively still, you’ll get much better quality and resolution from that. On paper, you’ll see a fairly respectable 960p (which means 1920 x 960) HD video resolution at 30 fps. However, if you’re unfamiliar with 360° videos, it’s important to understand that while this resolution would look great on a 2D surface such as a 20-inch monitor, when stretched to 360 degrees around you, the quality degrades enormously to something that more closely resembles 240p (the math isn’t an exact science, and the distribution of pixels isn’t even, so take this as a back-of-the-napkin calculation). This is true of all low-cost 360° cameras. If you want 4K 360° video, you’ll pay through the teeth for it, and even then the perceived resolution is still only marginally better than DVD quality. For great quality 360° videos — the same as HD video standards — we’re going to need at least 12K, combined with foveated rendering Why Virtual Reality Technology Will Blow Your Mind in 5 Years Why Virtual Reality Technology Will Blow Your Mind in 5 Years The future of virtual reality includes head, eye and expression tracking, simulated touch, and much more. These amazing technologies will be available to you in 5 years or less. Read More to ensure we only download the area we’re currently looking at. Thankfully, Facebook and a number of other companies are working on this technology. With the Elecam 360 specifically, I found that the colors appeared oversaturated and the white balance was tuned more to the outdoors. Inside even on a sunny day it looked quite dark and gloomy in a bright kitchen. While a DSLR will typically allow you to choose a subject and adjust the white balance appropriately, the situation is more difficult when your subject is everything around you. The closest comparison we can make is the older Ricoh Theta M15 model Ricoh Theta Review Ricoh Theta Review We're taking a fresh look at the Ricoh Theta now that 360 degree videos are more widely supported. While it won't replace your DSLR, the Ricoh Theta is ridiculously good fun. Read More , which records at a marginally higher 1080p, but only 15 fps. The Ricoh is also limited to 5 minutes, and only has 4 GB internal memory, while the Elecam 360 comes with a 32 GB micro-SD card. The Theta M15 is nearly twice as expensive, too. Purely for smoother 30 fps video, longer recording time, and cheaper price, I would opt for the Elecam 360. I feel I should also comment on the choice of bundling a bicycle and helmet mount in the package. One of the main causes of VR-sickness Virtual Reality Still Has 5 Big Problems to Overcome Virtual Reality Still Has 5 Big Problems to Overcome Despite all of the hype surrounding the recent surge in virtual reality products, there are many challenges that still need to be addressed before VR goes mainstream. Read More is when your brain perceives a mismatch between motion it’s seeing but not feeling. If you want to record videos for playback on VR devices, movement is the worst possible thing you could do. YouTube has released a series of guidelines for 360° video production which are worth reading, found in their Creator Academy. The TLDR is to keep the camera still unless you want your audience to throw up. The helmet and bike mount aren’t specific to this camera, so it would best to think of them as a little bonus that you could use with another action cam. Should You Buy an Elecam 360? At this price point, you won’t find anything better than the Elecam 360. 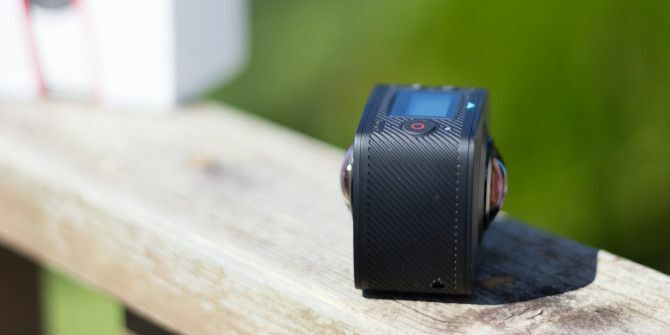 It’s a budget camera — easily as good as the lowest quality Ricoh Theta model — but bear in mind that videos will have a perceived resolution of around 240p when fully stretched out in a sphere around you. It’s a fun novelty, but the technology just isn’t there yet for high quality productions, and likely won’t be for a very long time. Grab yours now from GearBest if you want to get started with this exciting hobby. Explore more about: Digital Camera, MakeUseOf Giveaway, Virtual Reality. Thanks for amazing giveaways.I wish to be lucky.